2008 They call him Daddy! St. Anthony's Children's Home response to the poorest of Jamaican children. Get involved and share our information with others. “For I know the plans I have for you," declares the Lord "plans to give you not afflication but peace and a future." At St. Anthony's Childrens Home (SACH) the fruit of our efforts have grown to over 200 children. Their names and some of their accomplishments within the following list;. Donna L. - SAC prior to 1979, Employee of Peat, Marwick, Mitchell & Co. (KPMG) killed on 9/11/01 in WTC. 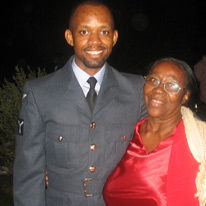 Andre M. - SAC after 1979, lives in UK, serves in the Royal Airforce. Jerimane G. - SAC after 1991. SACH between 1987-1999, works for a pharmaceutical company. Simone M. - SAC after 1991, works for an educational non-profit organization. Andre N. - SAC after 1992. Timothy O. - SAC after 1988. Cadesha O. - SAC between 1980-2000, BA in Teaching from St. Joseph Teacher's College, USA. Jacqueline T. - SAC after 1984. Andrew W. - SAC after 2001. Theordore W. - SAC after 1993. Kerri Ann L.- SAC after 1994. Dahlia P - SAC after 1989. Natasha Reynolds - SAC between 1988-1993. Sherice P - SAC between 1988-1993, went from below average to "A" Student. Lamont P. - SAC after 1988, works for a computer stationary store. Billy - Current SAC since 1997. Chantel - Current SAC since 2001. Mary - Current SAC since 2006. Oneila - Current SAC since 2006. Jazel - Current SAC since 2005. Sidani - Current SAC since 2003. Roxanne - Current SAC since 2003. Latisha - Current SAC since 2005. Matthew - Current SAC since 2005. Annie - Current SAC since 2005. Bam Bam - Current SAC since 2001. Dante - Current SAC since 1998. Kevin- Current SAC since 1996. Latoya - Current SAC since 2005. Andrew - Current SAC since 2001. Raymond - Current SAC since 1992. Erresha - Current SAC since 1996. Queola - Current SAC since 2001. Mitsy - Current SAC since 2002. Yashorna - Current SAC since 1988. Jermaine - Current SAC since 1996. Kamalee - Current SAC since 1991. Kimani - Current SAC since 2003. David - Current SAC since 1996. Abby - Current SAC since 2005. Mario - SAC since 1996. Tamara - Current SAC since 2006. Brittany - SAC since 2005. Tiffany - SAC since 2005. Devin - SAC since 2004. Dwayne - SAC since 2005. Karlene - Current SAC since 1990.